The No. 1 ranked university for innovation by U.S. News and World Report is now offering an Executive Master of Public Administration degree that features a Washington, D.C. component. It’s available to public administrators and other professionals around the world. Applications are being accepted for the first cohort of Arizona State University’s Executive MPA program. 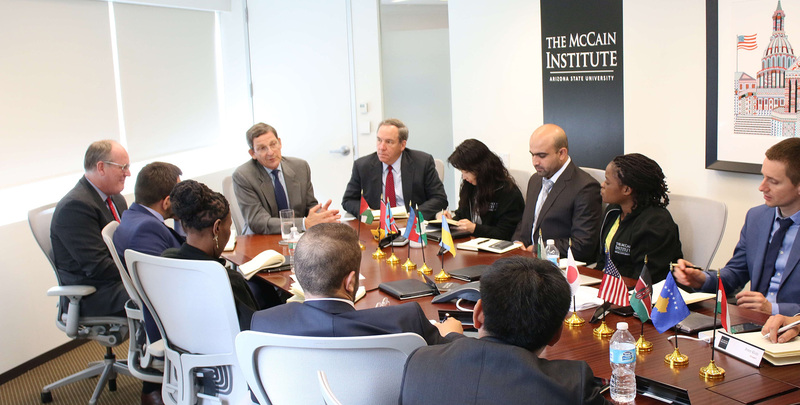 The ASU School of Public Affairs is offering the degree in collaboration with the McCain Institute for International Leadership. The new degree provides the flexibility of online courses taught by experts in their respective fields and features an in-person learning and networking component. Classes begins in May 2017. “People in public affairs are increasingly feeling the need for tools to help manage the very complex problems that they face,” said professor Ethan Kapstein, academic director of the new executive MPA program and senior director for research at The McCain Institute in Washington, D.C. "This degree is for people who aspire to leadership positions in public administration or who work at senior levels with government officials." Classes will be taught by leading faculty from the ASU School of Public Affairs, W.P. Carey School of Business and the Thunderbird International School of Global Management. All are highly-ranked schools by US News and World Report. Students will also be introduced to leaders in different levels of government through executive sessions in Phoenix and at The McCain Institute in Washington. Simply put, the challenges faced by government are much more complex these days. Managers who have succeeded through hard work and intuition find there is an upper limit to what they can achieve. That’s why “Master’s Degree in Public Administration” is increasingly required on job applications. Successful managers need the knowledge, critical thinking and decision-making skills gained through an MPA degree. "It will provide students with skills that they're going to need as they attain more senior leadership positions, so, it will make them more effective,” Kapstein said. “Increasingly, government positions require at least a master's degree in order to be promoted to that next level." The degree is aimed at public sector professionals who aspire to leadership positions in public administration or who already work at senior levels in government in the United States or internationally. The program can also be valuable to those working in government affairs in the private sector or for professionals in non-governmental organizations. "For some of them, this degree will be an opportunity to advance within their current career track,” Zelaya said. “For others, this is an opportunity to switch career paths." A minimum of five years of progressive leadership experience is required of applicants. Admission will be based, in part, on what kind of experience each student brings to the program. “Our decision to admit a student will take into consideration the value that they're going to bring to the learning experience of their classmates,” Zelaya said. Hector Zelaya, director of executive education at the ASU School of Public Affairs, congratulates a graduate of the Bob Ramsey Executive Education program at Arizona State University. The new ASU degree is designed to maximize the advantages of online learning and face-to-face sessions. The 19-month executive MPA program will begin in May 2017 with an orientation and executive sessions in Phoenix. Students will take one course at a time, and the first course will start after the orientation session. Each course is six to seven and a half weeks long, and some are scheduled during summer months by design. "We really took into consideration the workload of the people we anticipate taking this program and we are making the assumption that their workloads are lighter in the summer," Zelaya said. Executive MPA students will take traditional management classes such as Organizational Behavior, Leadership in Public Organizations and Ethics. But they will also benefit from specialized courses such as E-Public Administration, Data Analytics for the Public Good and Global Negotiations. Students will have the chance to meet government leaders at another round of executive sessions held in May 2018 at The McCain Institute in Washington. A McCain Institute Debate and Decision Series event held in Washington, D.C. in October 2016. Students will wrap up classes in October 2018 and began work on an applied project. They will present their applied projects in Phoenix in December and have the opportunity to take part in Fall 2018 commencement days later. For more information about the ASU Executive MPA degree, please visit the degree webpage at the ASU School of Public Affairs website.